This is the beginning of our fourth full year homeschooling (plus the additional semester when we abruptly withdrew Amber from parochial school). 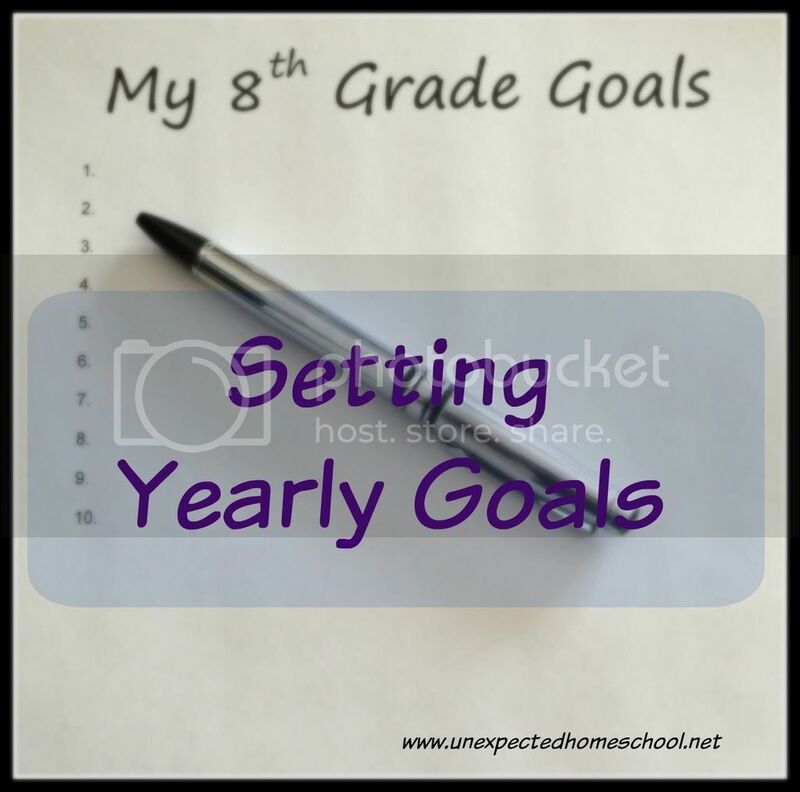 While we've always had an idea of where we wanted the school year to take us, I've never set formal, written goals for the year. However, Amber is a teenager now with a full year of school experience knowing which chronic illness is affecting her, and we feel more formal goals will be of benefit. Tracking progress on these goals will let us know where growth is happening and where we need to still work. Our intent in writing the goals down this year is simply so we can stay on track with what is important and what we've discussed together without losing focus. The emphasis is to help Amber learn to live her life fully, even with a chronic illness. Of course, many of these goals depend on better dysautonomia symptom control, but even on symptomatic days Amber must continue pushing to her limit in order to keep her body going. Regular Exercise - This is now a priority. We need to schedule this in our day and make it a non-negotiable item as opposed to a free-time option. More timely completion of household chores - Amber does her chores, but often puts them off until the last dire moment. She will work on completing the chores without being asked repeatedly. We've already seen some progress this summer. Awake earlier in the mornings and go to bed at a more consistent time - While she isn't up crazy late, her bedtime fluctuates wildly some weeks. This, coupled with insomnia, has become a major cause of unpredictable morning wake up times. Gradually return to a set daily schedule - After becoming ill, we dropped regular schedules and simply worked when Amber was able. We hope the new medication will help her be less symptomatic and able to return to a more set daily schedule. Continue working on assignment responsibility and self starting - Amber has been doing a great job this summer completing her two daily subjects without much prodding. She appreciates our switch to Home School Tracker Online, which allows her to see scheduled assignments and detailed directions without printouts that might become outdated. I'd like her to progress even further in this area. We still meet throughout the day for discussions and other work together, but as Amber approaches high school she will need to be more independent of me for assignment completion. Practice flute without reminders - Amber adores the flute and is becoming quite skilled with it. Though there are days where I need to remind her multiple times to practice because the enticement of another activity is always there. I do understand this is the nature of kids, and I was once like this in regards to my piano practice. I would like to see Amber work towards practicing without reminders. Make time for creative expression - Amber has all kinds of creative ideas, but rarely the time for it. This is often because we have not scheduled her day well, or spent a lot of time resting. I would like to make it a priority to give her more time for creative endeavors. Hopefully these written goals will make it easier for us to keep on track this year. I'm excited to see how much Amber grows over her final year before high school!